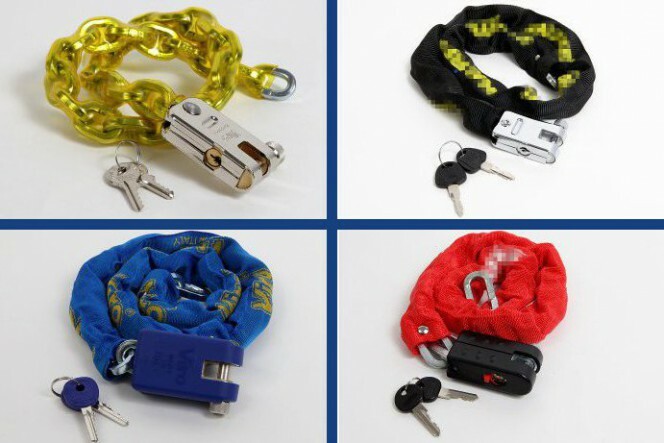 Chains & Padlocks: the Viro originals do not fear bad weather! We recently talked about tests which check the resistance of products, whose duty it is to ensure security. In particular we focused on the Viro Morso with chain, testing its resistance to cutting and being struck by blows, after the salt spray corrosion resistance tests. To make the most of our considerations, we performed the same procedure on a copy of the product, imported from the Far East. This week we are also looking at the “big brother” of Viro Morso, the Supermorso, and also at a copy imported from the Far East. We see the reaction of both the Viro products and their copies, after the salt spray tests, performed in our laboratory. The salt spray corrosion resistance test reproduces a process of “accelerated aging” by creating, in a special machine, an extremely hot, humid and corrosive atmosphere. The products undergo, for every hour of the test, the equivalent of about one week’s exposure, outdoors, to every type of aggressive atmospheric agent. After 40 hours of salt spray testing (which corresponds to approximately a year of life in a real environment subjected to harsh weather conditions), the only point that shows some signs of oxidation in the Viro Morso is the rivet which locks the padlock to the chain – a component which is not linked to the resistance of the product – whilst the outer armour and, above all, the internal mechanism, are free from corrosion. However, its copy showed signs of oxidation in various parts, on the handle and on the armour, which is symptomatic of damage to the internal mechanism. In fact, as can be seen in the video the copy does not open after the test, whilst the internal mechanism of the Viro Morso is still working perfectly. As is the case for the Morso “little brother”, the internal mechanism of the Supermorso is still operational after 40 hours in a salt spray test. As can be seen in the video the Supermorso mechanism, even though the lock cover cap integrated in the nylon cover was deliberately left open during the duration of the test, it operates without difficulty, whilst the copy has become completely unusable. The first shows no signs of corrosion on the padlock, whilst the second is totally compromised by the oxidation. Once again we can confirm that: the original is much better than the copies! This entry was posted in Locks and tagged products, technology, tips on 12 July 2016 by calessandrini.